I just made a poster print available on Zazzle featuring my Sgt. 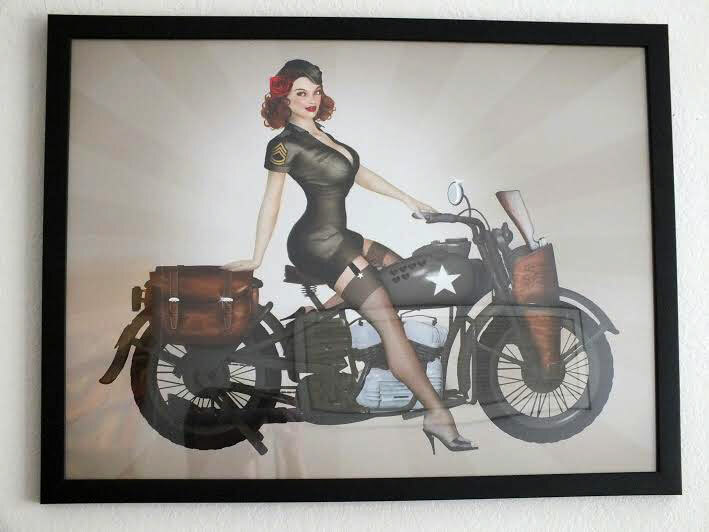 Davidson Army Motorcycle pin-up. Seems to be one of my more popular pinups, so I think I might have to do some more using bikes and uniforms. This print looks really awesome by the way. My mom wanted one for Christmas, so I ordered her one. I know it’s only Dec 21, but she already opened it, so it’s ok to tell… She sent me a photo of it (featured above) so this is what the ” 24″ x 18″ Black Wood Frame option actually looks like.